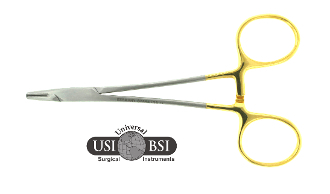 The Mayo-Hegar Needle Holder is a lockable, finger ring instrument available in a variety of sizes, and can be used in multiple types of surgical procedures. The Mayo-Hegar needle holder is commonly used with larger heavier suture, made easy due to its wide jaws. The tungsten carbide tips provide a better grip for the practitioner. Tungsten Carbide tips are also serviceable extending the work-life of the instrument with proper instrument care.